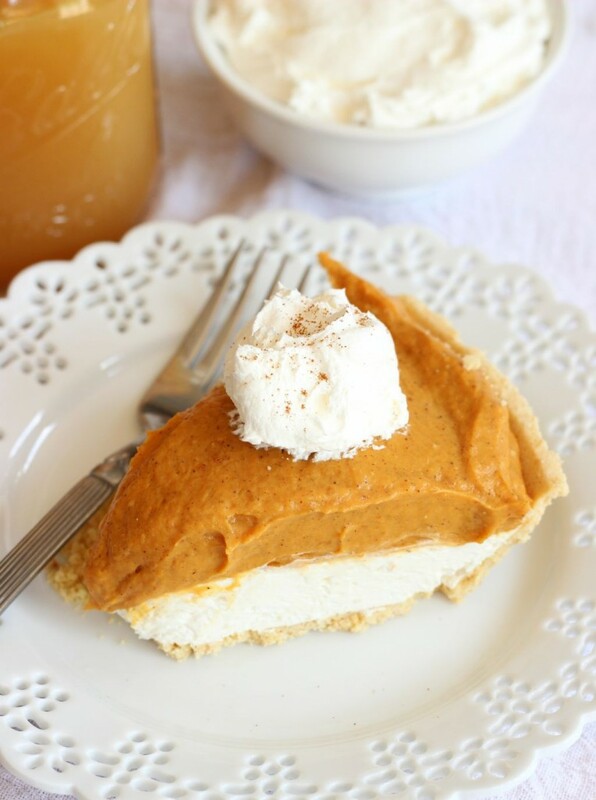 This quick and simple No Bake Pumpkin Cheesecake comes together in 10 minutes! 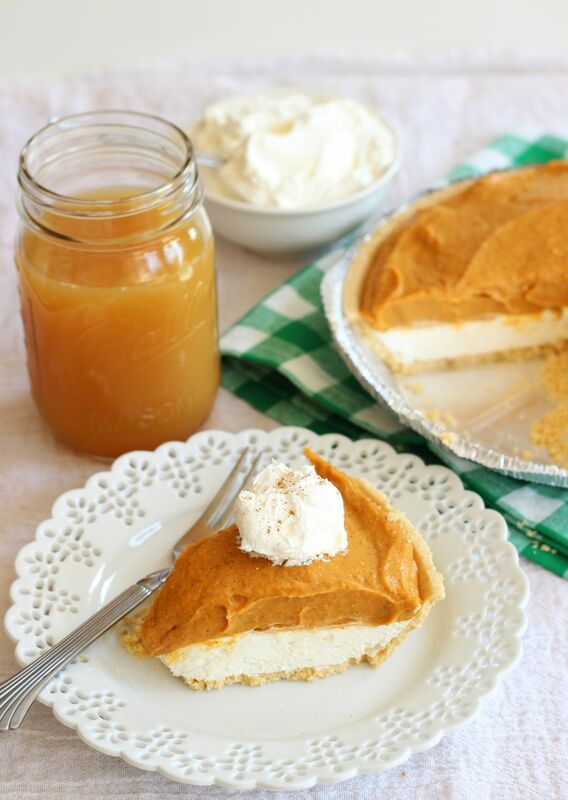 With just a handful of ingredients, this No Bake Pumpkin Cheesecake is a delicious dessert for holidays and Thanksgiving. 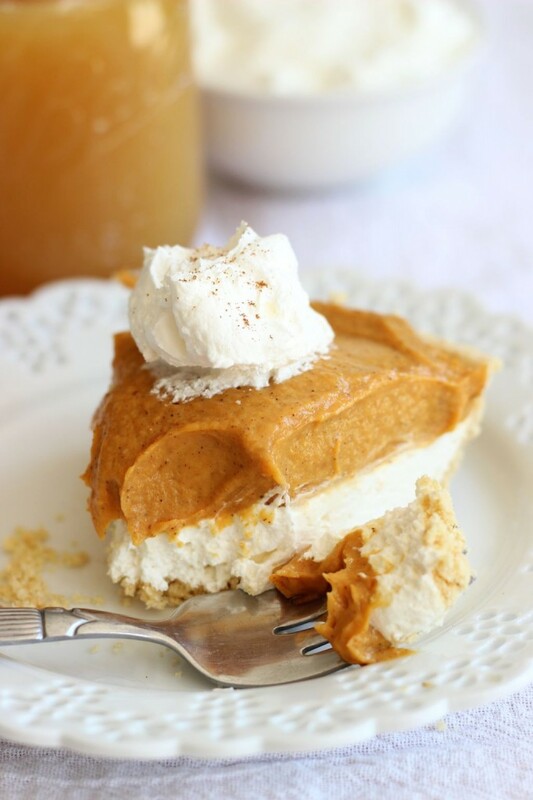 Loaded with pumpkin and spice, and a layer of creamy cheesecake, it’s always a crowd-pleaser! A couple of days ago, I gave you the world’s best traditional pumpkin cheesecake. The one food that keeps my domestic relationship running as smoothly as it does. Without it, who knows where S.O. and I would be? Okay, I kid. We do just fine either way, but good food doesn’t hurt. Now, the previous pumpkin cheesecake I shared is NOT hard, and it’s not a ton of work, but it does require some time. Cheesecake has to bake for so long, and cool for even longer, so if you’re in a pinch, it’s probably not the way to go. 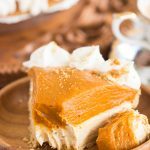 This recipe ultimately yields a similar result, a Double Layer No Bake Pumpkin Cheesecake, but in basically 10 minutes flat. Admittedly, this No Bake Pumpkin Cheesecake is not as ‘fancy’ or elegant as a traditional cheesecake, but it’s still super delicious. At the end of the day, what will people focus on? This is the recipe I relied on for years when I wanted a quick seasonal dessert on hand, and it’s also the recipe that inspired the more traditional version I made and shared. 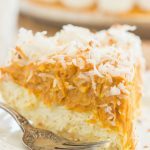 This No Bake Pumpkin Cheesecake is not my own creation – pretty sure this recipe has been floating around for decades – but it is one I keep around for good reason. 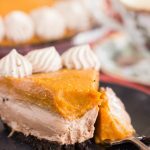 It doesn’t get faster or easier than this No Bake Pumpkin Cheesecake, and it still gives you all the awesomeness that comes with combining pumpkin, spices, and cheesecake. It’s also very light, not heavy like traditional cheesecake, so it’s a good post I-stuffed-myself-silly-at-dinner option. You can make this No Bake Pumpkin Cheesecake in literally 10 minutes. Maybe even 7-8 if you reeeeally focus. That’s the beauty of no bake desserts!! I’d be lost without a few of those in my repertoire! A super quick and easy no-bake layered pumpkin pie! 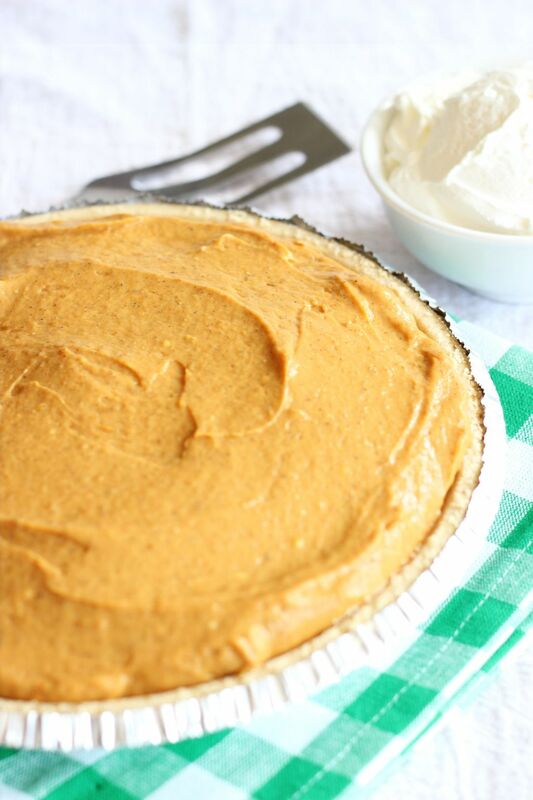 This pie has a cheesecake layer, and a pumpkin pie layer, with lots of spice and creaminess. 1 9 oz. prepared shortbread or graham cracker crust must be the LARGE prepared crust, not 6 oz. In a small mixing bowl, beat cream cheese, 2 tbsp. milk, sugar, and vanilla until smooth. Spread this mixture evenly into the bottom of the crust, careful not to lift up any crumbs in the crust. In a large bowl, whisk together vanilla pudding mixes, 1 c. milk, pumpkin, and spices until smooth. Carefully spread the pumpkin mixture over the cream cheese layer. Refrigerate for 2-3 hours. Serve! Dollop with Cool Whip for garnish, if desired! 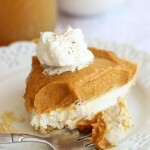 Now go whip this No Bake Pumpkin Cheesecake up in a jif! I love this no-bake version, Sarah! Such a great idea if you’re in a time crunch. I’ve made cheesecakes both ways over the years, and each one tastes delicious on its own! I love that this one is a double layer too, which means more cheesecake-y goodness! Thanks, Gayle! Yes, it’s insanely fast to throw this together, and it’s nice and light! You can use sugar-free pudding, light Cool Whip, reduced-fat cream cheese, etc. It health-ifies pretty easily! 🙂 Hope you’re having a fabulous weekend!! I was wondering what part 2 could be, no bake never even occurred to me for some reason! 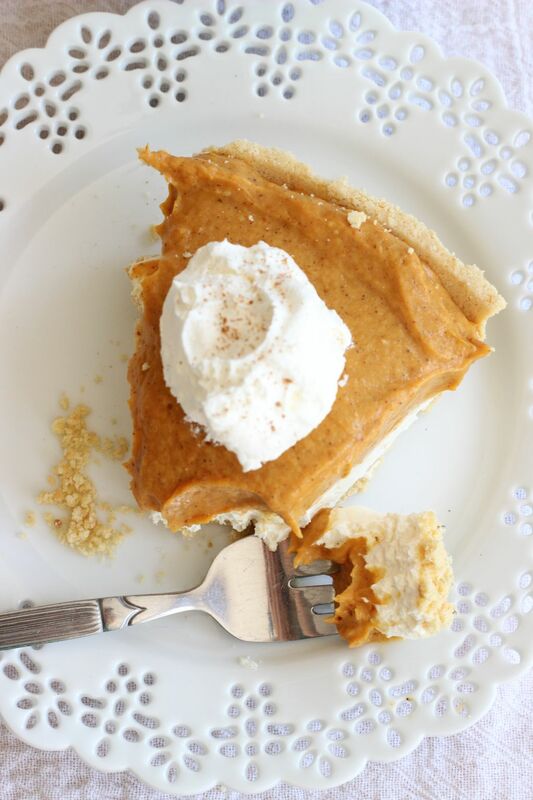 This looks like the perfect easy no bake pumpkin dessert! Haha! Since I happened to have 2 recipes for layered pumpkin cheesecakes, and they’re totally different, I just thought it would be fun to do a ‘mini-series’! This one is the easiest and quickest dessert ever. It’s nice when you want something less heavy and rich too. 🙂 I typically use sugar-free pudding, lite Cool Whip, reduced fat cream cheese, etc. This lightens up easily too! I’ll have to check to see if I remembered to include that info…. Hope you’re having a fabulous weekend! 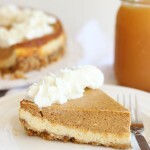 Oh my god this pumpkin cheesecake looks so delicious.. Wish I had a slice to devour right now! Pinned! Thanks, Thalia! I wish I could send you some through the computer screen!!! It’s so easy though, you could whip it up in minutes! 🙂 Thanks for your kind comment! Totally! It’s super fast to throw together! We all need a few recipes like that on hand! 🙂 Thanks, Zainab! Hope you had a fabulous weekend! Wow! Look at those rich, creamy layers! I love no bake desserts and wouldn’t be able to resist eating a few slices of this cheesecake! It’s lighter than traditional cheesecake too, so it’s easier to stuff in extra servings! Haha. 🙂 Thanks so much, Ashley! So Yum!! I need this now! Can I pre make this and freeze them as little single serve cups? Hi Matt! I have never tried to freeze it. The bottom layer is mostly cream cheese and Cool Whip, which should freeze just fine, since it’s typically frozen anyway. The top layer is mostly pudding and pumpkin – I’ve never frozen a pudding before so I can’t say for sure. I *think* it’d probably be fine too, but not certain. At the very least, you can mix up each layer in bowls a few days ahead of time, and have them all ready to go in the fridge. I hope that helps! Beautiful job with this one! this may be a silly question- but do you make the pudding before you put it in with the pumpkin or do you just combine the instant pudding dry with the pumpkin? Not a silly question! I could see that being confusing. I’ll go back in and edit. You don’t make the pudding. You add the dry pudding mix to the pumpkin, milk, and spices! Make sense? Thanks so much! You only use 6 oz of cream cheese (two 3 ox packages)? Or is it supposed to be 16 oz pf cream cheese (two 8 oz packages)? Just want to make sure I make this correctly – looks delicious! Correct! This cheesecake only takes 6 oz. of cream cheese total. It gets a lot of volume when you add in the Cool Whip, and still has lots of cheesecake flavor! Thanks so much! Love the simplicity of this recipe, but I do have one problem. It seems like the cream cheese layer took up the entire pie shell. After making the pumpkin layer, the pie would have been overflowing if I used it all. I used the recommended shortbread pie shell – 9″. Maybe my pudding size was too big? I used 2 – 3.4 oz. puddings. Serving tomorrow, hopefully the ratio of the two layers isn’t too out of whack. Hi Elizabeth! That should be the right amount of pudding if you were using regular instant, not sugar-free. Hmmm… my pie does become quite a large mountain and pile up of filling, but I definitely like it that way. It’s not a level pie in the end, if that’s what you were expecting. You should be good and the proportions should be fine, but let me know how it turns out! Thanks for your comment! Good luck! Wauw! this recipe was so much fun to make. I saw it on pinterest and followed the link here. and oh my this screams Fall!! where I’m from it’s summer all year round, which gets boring..
And since it’s been finally raining I just had to try it! could I share a picture? if so how? Anyways, thanks and I am totally subscribing girl!! 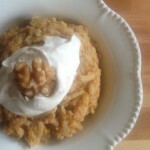 Such a fun recipe and perfect for this week. Thank you! This looks utterly delicious, and utterly simple! Wow! What a great dessert! Love that its double layer and no bake! I love this! Looks simple and delicious! even add the pumpkin cus it’ll just go right into the cream cheese cause it was so thin & watery. was it maybe because the cool whip was frozen? how am i able to fix it? I’m sorry – I have no idea! It definitely could’ve been the frozen cool whip. I’ve never had it turn out watery at all. It’s very possible that the whipped topping created more liquid as it thawed! Just made it and loved it! Very simple and easy to make. A perfect quick and easy recipe. Thanks for sharing! Oh yay!! I’m so glad it turned out for you, and that you liked it. Thank you so much for letting me know! Hope you had wonderful holidays, and HAPPY NEW YEAR! Best recipe ever! I’ve made it the last 2 Thanksgivings and just popped one in the fridge. It’s always a huge hit with the family and friends! Yessss!! I’m so happy to hear this. Your comment seriously made my day. I’m so glad you like this cheesecake. 🙂 I hope you had a wonderful Thanksgiving!! I think the traditional cheesecake is probably too big for a regular pie plate! If you had a deep dish pie plate, it might work! How funny that you’ve never used your springform pan, but I TOTALLY understand having kitchen fears because I still get intimidated when making anything yeast-based – I never know if it’s going to turn out or not! The springform is a cinch. Just make sure to cool the cheesecake before removing the edge of the springform, and it also helps to chill it. Run a knife around the edge, and then pop it off. It won’t pull any edges of the cheesecake if you’ve cooled it enough, and if you’ve greased it!! 🙂 The regular cheesecake is one of our FAVORITE DESSERTS OF ALL TIME!!! So, would you please clarify? … is it 6 oz. or 8 oz? Hi there! Thank you for checking, and thank you for pointing out the discrepancy!! Originally, the recipe took 2 – 3 oz. packages of cream cheese. I never see 3 oz. packages of cream cheese anymore, so I eventually just started using 1 – 8 oz. package. The 2 oz. difference doesn’t affect the pie, and it’s easier to find an 8 oz. package. I’ll go back into the recipe to clarify that. Thank you so much for checking! I love this pie! My own favorite touch is to make my own crust in a 10″ plate using crushed spiced wafers mixed with some melted butter, with a few crumbs sprinkled on top. The wafers are such a delicious compliment to the pumpkin flavor! Hi Sarah, thanks for the recipe. I made this last night and both my cheesecake ahs pumpkin layers are runny and haven’t set despite being in the fridge overnight. What can I do when I make it next to ensure that doesn’t happen? I haven’t eaten it yet, but I think the cream cheese should have been melted, at least partially. The cream cheese was chunky after beating and even after folding in cool whip. Kind of a cottage cheese consistency. Also there was about twice the amount of that mixture, I had to throw half away because it filled the whole shell up before even adding the pumpkin mixture. Excited to try but I had those hang-ups while preparing. The cream cheese should be softened to room temp, definitely, as indicated in the recipe instructions, but I would imagine that melting it wouldn’t be necessary. Also, it does call for the larger 9 oz. prepared crust, NOT 6 oz. crust so that everything fits. Which size crust did you purchase? The pie is tall, and that’s how I intended it to be, so that is the CORRECT amount of cheesecake layer. Sorry that it’s too much cheesecake for you – that’s how I like this pie! It’s based on an old, tried-and-true, Kraft recipe – and I didn’t make many changes, so it’s definitely correct. Sorry that it wasn’t the right pie for you! Have a great Thanksgiving! This recipe was perfect! I made it almost exactly as directed except I didn’t have all the extra spices (so I just used double pumpkin pie spice) and I put one recipe into two 6 inch pie plates since I didn’t want it heaping over the top. I even made a crustless version in a 9×9 baking dish. Double pumpkin pie spice was probably perfect! I bet that made for a great substitution. Great idea to make two smaller pies! I bet those were plenty full enough. I’m so glad you found it easy, and I really hope you like it!!! Thank you so much for your comment, and Happy Thanksgiving! Understandable! Cloves are pretty potent! Yep, leave them out or cut them down to just a pinch or something! Please let me know how it turns out for you otherwise! 🙂 Happy Thanksgiving! I made this for Thanksgiving.YUMMMM.I used a Graham cracker crust and sprinkled chopped pecans on top.Everyone raved about this pie.Thanks for the recipe! Thank you so much, Mary! Hope you had a wonderful holiday!